It would be pretty darn awesome if, whenever I got the hankering for a Philadelphia Cheesesteak, I could instantly arrive in Philadelphia to a place like Pat’s King of Steaks or Geno’s Steaks! Chicago is a long way from Philadelphia and the door step of Pat’s or Geno’s, which is why I decided I needed to find a way to make something comparable at home. Why is it that a fabulous Philly Cheesesteak seams so unobtainable to make in the comfort of your own home? I think it’s because it’s near impossible to get beef super thinly sliced unless you own an industrial grade meat slicer. And well, I don’t know anyone with that luxury! 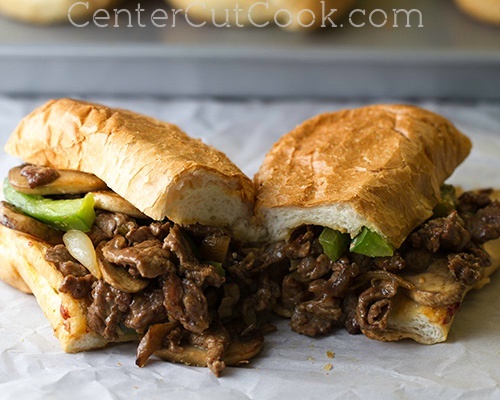 After much research, I finally turned to my pal Chris Kimball from America’s Test Kitchen (we’re not really pals, but I sort of wish we were) to help me come up with the best way to make Philadelphia Cheesesteak Sandwiches at home. 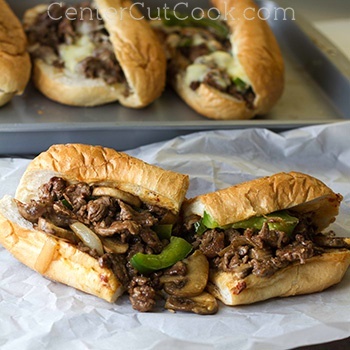 Today I’ll be sharing melt in your mouth Philly Cheesesteak Sandwiches with a recipe for the classic version, or a chipotle version. Let’s start with the beef! 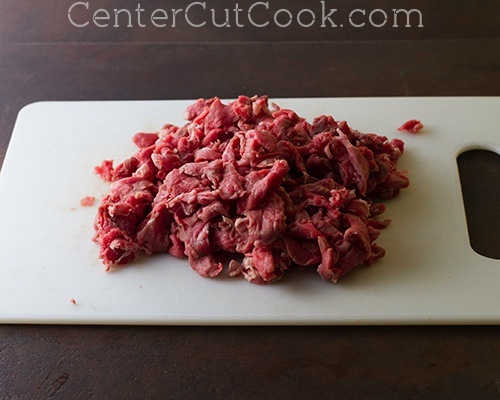 Traditionally, a Philly Cheesesteak is made with thinly sliced ribeye. Ribeye steaks tend to be a bit pricey. Chris recommended skirt steak which is more reasonable priced, but since my grocery store didn’t have it, I went with top sirloin. Now here is the important part. To be able to cut the beef into super thin pieces, you are going to want to freeze the meat first, about a full hour before you work with it. Freezing the meat helps firm it up so that slicing it thinly will be a more do-able task. I bought about 1 and 1/4 pounds of top sirloin, froze it, and then used a very sharp knife to thinly slice it against the grain. The thinner you can get it, the better. Take your time doing this step. It took me a full 10 minutes to thinly slice the steak. Next comes the veggies. Or not. I love onions, peppers, and mushrooms on my cheesesteak, but Ryan likes his with just meat and cheese. 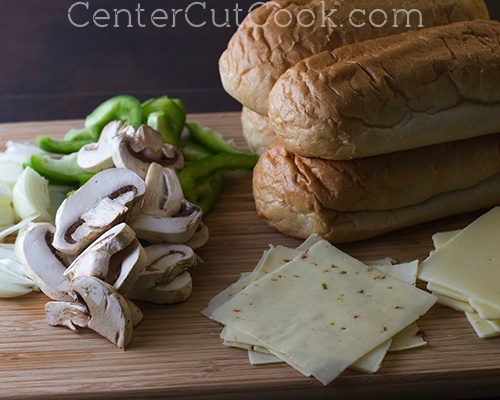 If you want veggies, slice up one very small yellow onion, half a green pepper, and about 4-6 ounces of mushrooms for 4 sandwiches. Have you heard of Jersey Mike’s before? It’s a sub shop that has a delicious Chipotle Cheesesteak sandwich that I just love! If you’re in the mood for the spicy chipotle version, you’ll want some thinly sliced pepper-jack cheese on hand. For the more classic version, I went with white american cheese and I’ll tell you why. While provolone or even cheese whiz would be a more traditional route to take, I love the way white american cheese melts with the cheesesteak. It’s creamy, and cheesy, and yummy, and melts better than provolone cheese! 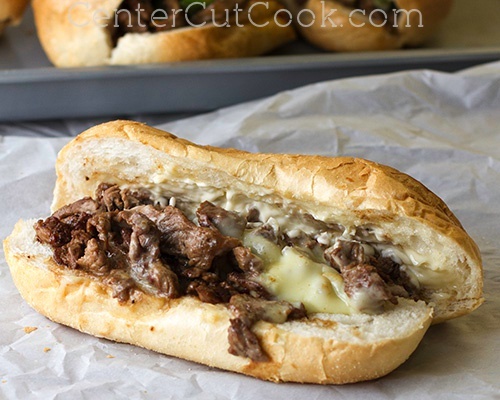 Another important and necessary ingredient for a Philly Cheesesteak is the roll. Unfortunately I couldn’t get my hands on Amoroso’s rolls, so I went with a soft hoagie roll from the bakery department at my grocery store. If you want veggies on your sandwich, you’ll start by sautéing them in a little butter until they’re tender. Then remove the veggies from the pan. Next it’ll be time to cook the meat. Because it is sliced so thinly, it’ll cook quick! I cooked the meat in two separate batches so that the pan wasn’t overcrowded and the meat was able to crisp up a little. I recommend you do the same. Start by heating a little canola or vegetable oil in a large skillet. When the oil is nice and hot, add half the meat and cook for a few minutes, until it is cooked through. You’ll season it with a little salt and pepper. Next comes the cheese, which in my book, is the most important part! 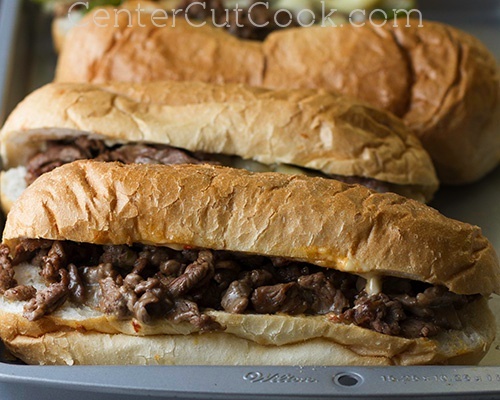 If you want the Chipotle Cheesesteak, place slices of pepperjack cheese over the meat. For the classic version, arrange white american cheese slices over the meat. Other options include provolone or even *gasp* cheese wiz, but I love the way american cheese melts into this sandwich. Stir up the meat and cheese, and add veggies back in if you wish. While the meat is cooking, you’ll want to heat the rolls in the oven. I heated them for about 5-7 minutes so that they were just heated through. I pulled the bread out before it started to get crispy and crunchy. Next, scoop the steak and cheesy mixture into the rolls. The very last step is to add mayo if you wish. For the classic sandwich, use plain mayo. For the spicy chipotle version, you will use a chipotle mayo that you can easily make at home in just a few minutes. I originally used it on these Chipotle Chicken Club Sandwiches. 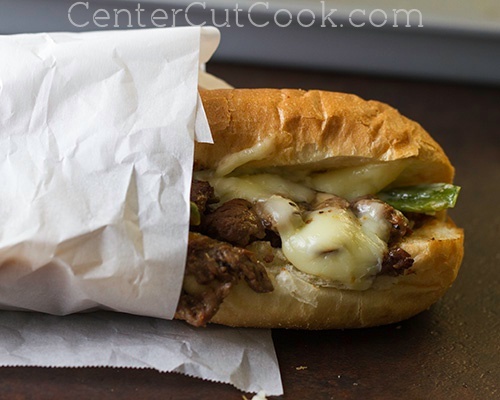 Lastly, take a bite into this melt in your mouth Philly Cheesesteak Sandwich and savor every. last. bite! 1 hour before cooking, place steak in the freezer. When you’re ready to start cooking, pre-heat your oven to 400 degrees. Melt 1 tablespoon butter in a large skillet over medium heat. Cook veggies until tender. While the veggies are cooking, remove the steak from the freezer and use a very sharp knife to slice the meat as thinly as possible against the grain. When the veggies are done cooking, heat 1 tablespoon canola oil over medium high heat. Place 4 hoagie rolls in the oven for 5-7 minutes or until nice and warm, but not crunchy. Add half the meat to the pan and season with a bit of salt and pepper. Cook for a few minutes until it is cooked through. Set aside. Heat a bit more oil if needed and cook the other half of the meat, seasoning with salt and pepper. Return the first batch of meat to the pan, stir in veggies if yo wish, and top with cheese. Use 8 pepper jack cheese slices for a spicy version, or 8 white American cheese slices for a classic version. Place the cheese over the meat and when it starts to melt, stir the cheese into the meat and veggie mixture. Divide the meat among the 4 hoagie rolls. If using chipotle mayo, combine all ingredients in a blender (mayo, chipotle pepper, chipotle sauce, lime juice, salt and pepper) and slather desired amount on each roll. Otherwise spread a thin layer of regular mayo on the roll.